Gonzaga seems to have the hang of this year-after-the-year thing. Long recognized nationally for its string of 19 straight NCAA Tournaments, the Zags have moved into the forefront the last five years with arguably the three best seasons in program history. There was the 32-win squad in 2013 led by All-American Kelly Olynyk and sidekick Elias Harris. They earned the program’s first No. 1 ranking and No. 1 seed in the NCAA Tournament. There was the 35-win team in 2015 that went toe-to-toe with eventual national champion Duke in the regional final. And there was last year’s 37-win crew that nearly won it all and came within a handful of possessions of an undefeated season. The Zags led both games they lost – to BYU in the regular-season finale and to North Carolina in the national championship – inside the last two minutes. If Gonzaga has proven anything since the 1999 team’s improbable march to the Elite Eight, it’s that it has staying power, so much so that the word “rebuild” has essentially vanished from Gonzaga’s lexicon. The Zags have avoided major drop-offs that strike even the bluest of bluebloods. They’ve replaced All-Americans. They’ve adapted to fit their personnel to continue adding chapters to one of the most unique stories in college basketball history. “One of the things we always talk about is continually growing the program and not trying to plateau,” assistant coach Tommy Lloyd said. “It’s been an accumulation and maybe you’ve earned more credibility over the years and that’s helped in recruiting higher-level players that still fit the mold of what works here. A history lesson shows the Zags have a track record of success even after breakout years, dating back to Mark Few’s first season when he guided GU to the Sweet 16 in 2000. Ardent followers will remember that Few’s first team lost three games by double digits in a five-game span late in the regular season, but pulled together to win the WCC Tournament and reach the Sweet 16. The 2006 Zags won 29 games with Adam Morrison leading the nation in scoring and J.P. Batista averaging 19.3 points and 9.4 rebounds. They rattled off 20 wins in a row. Number 21 and a trip to the Elite Eight looked to be in the books until UCLA’s comeback erased a 10-point deficit with five minutes left. Morrison bypassed his senior year to enter the NBA Draft and Batista and Erroll Knight graduated, but the 2007 squad still sported seniors Derek Raivio and Sean Mallon, juniors David Pendergraft and Abdullahi Kuso and blossoming youngsters Jeremy Pargo, Josh Heytvelt and Matt Bouldin. Kansas transfer Micah Downs joined the mix at midseason. They started off 5-0, including an upset of No. 2 North Carolina in Madison Square Garden. Five weeks later, they were 9-6 and saddled with a four-game losing skid. In early February, the program was rocked by the arrests of Heytvelt and redshirt Theo Davis on drug possession charges. They were both suspended for the remainder of the season. GU promptly lost to Santa Clara, snapping a 50-game home-court winning streak. The Zags regained their footing and claimed the regular-season title when Santa Clara stumbled late. They still had to win the WCC Tournament to make the Big Dance, and they did so with a 77-68 win over Santa Clara in Portland. They finished 23-11 – the most losses in the Few era – after falling to Indiana in the first round of the NCAA Tournament. 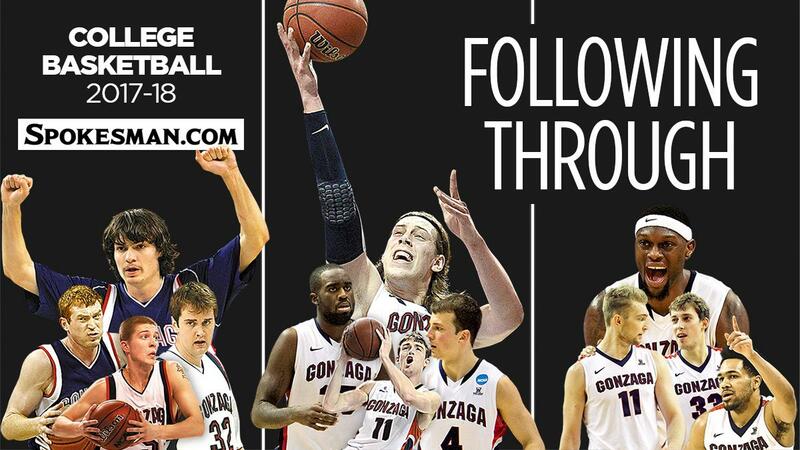 The 2013 crew, like virtually all of Gonzaga’s best teams, was led by a dynamic frontcourt. Olynyk made an enormous jump after a redshirt season, Harris was solid, Sam Dower Jr. was a gifted scorer and freshman Przemek Karnowski was the fourth big. Wichita State stunned Gonzaga in the round of 32. GU played without injured guard Gary Bell Jr. for nearly the entire second half. The 2014 Zags had high hopes with a veteran backcourt of Bell, Kevin Pangos and David Stockton, and a frontcourt featuring Dower and emerging sophomore Karnowski. The injury bug bit early with Pangos battling turf toe for months. Dower was sidelined after taking a hard fall on his back against Kansas State just before Christmas. Bell broke his hand early in the WCC season and missed six games. Depleted by injuries and short on frontcourt depth, the Zags’ versatility helped fill the gaps. They relied on an undersized three-guard alignment of Stockton, Pangos and Bell, but grad transfer Drew Barham stepped up as a stretch ‘4’ and Kyle Dranginis shifted between guard, wing and the ‘4’. Karnowski began to assert himself on an eventual 29-win team. Just as Pangos was getting over turf toe, he rolled his ankle. It happened a few more times, including during a second-round NCAA blowout loss to Arizona, but he still delivered 30-plus minutes every game. Bell injured his knee in a first-round win over Marcus Smart and Oklahoma State. Bell played on, but his knee would require extensive surgery in the offseason. The 2015 Zags didn’t sneak up on anybody. It was Pangos’ and Bell’s senior year. Kyle Wiltjer was eligible after sitting for one season following his transfer from Kentucky. Karnowski handled the interior and freshman Domantas Sabonis was an immediate contributor. USC grad transfer Byron Wesley was an ideal fit at the wing. They were in the top 10 from Thanksgiving on, reeling off 22 straight wins before BYU spoiled Senior Night in the regular-season finale. GU blasted the Cougars by 16 less than two weeks later in the WCC title game and had double-digit NCAA wins over North Dakota State, Iowa and UCLA before losing to Duke in Houston. The Zags were No. 9 in the 2016 preseason poll and looked strong on paper with a frontcourt of Wiltjer, Sabonis and Karnowski, but the Polish center went down with a back injury after just five games. Wiltjer and Sabonis logged heavy minutes and were the focus of every opposing scouting report as guards Josh Perkins, Eric McClellan, Silas Melson and Dranginis needed most of the season before finding their stride. Karnowski’s uncertain status complicated matters. The Zags dropped four home games for the first time since 1991. They were so thin with a seven-man rotation that practicing was a chore, but they meshed over the second half of the conference season. Wiltjer and Sabonis combined to average 38 points and 18 boards. The pair learned to avoid foul trouble while logging heavy minutes. The quartet of guards contributed points and defense. The Zags won the WCC Tournament, and probably had to to keep their NCAA Tournament streak alive. They blitzed Seton Hall and Utah. They led by nine late but Syracuse rallied with a 15-3 closing run. Gonzaga won 28 games and nearly reached the Elite Eight, the most recent example of the Zags following up one great season with another.